This mini-series will look at Pokemon who have the potential to make a big impact at the 2018 World Championships. The first article will talk about Gastrodon and why this Pokemon has a real shot at making waves at Worlds thanks to its current position in the VGC 2018 format. The main appeal to Gastrodon is in its Storm Drain ability, which draws in any single target Water type move to give the user a +1 Sp. Attack boost while rendering the attack useless. Spread Water type moves such as Muddy Water, Water Spout and Surf will still work regardless of the Storm Drain user being on the field, but if Gastrodon is hit, it will gain the Sp. Attack boost and the attack will still happen. This can make Gastrodon a very effective threat versus many Water types since it can use its Storm Drain ability to absorb Water type moves that its teammates won't enjoy dealing with. It's 2 other abilities in Sticky Hold which just means it doesn't lose its item if hit by Knock Off, and Sand Force which just gives it a 1.3x power boost to Ground, Rock, and Steel in the Sand, aren't strong enough to overtake Storm Drain's usage on Gastrodon. Gastrodon's Water/Ground typing is also very helpful because it allows it to threaten common Pokemon such as Tapu Koko, Incineroar, and Nihilego with Ground type moves while hitting Pokemon such as Incineroar, Landorus, and Charizard with Water type moves. Gastrodon can run other moves that can hit other Pokemon, but that will be covered later with sets to use on Gastrodon. This sample set for Gastrodon focus on its damage output while still being able to take hits. The original creator for this Gastrodon set notes that it can survive Never-Ending Nightmare based off of Shadow Ball from Aegislash and also out-speeds base 40 speed Pokemon like Rhydon and Camerupt when they are at -1 Speed. The moves for Gastrodon are very simple. Scald and Earth Power are your main STAB moves. These are going to be the attack you'll use the most when your Gastrodon is on the field. Scald is great for hitting common Fire types such as Incineroar and Mega Charizard Y if the Sun isn't in the picture, and other Pokemon such as Landorus-Therian and Mega Metagross, although any physical attacker won't enjoy Scald's 30% chance to burn them. Earth Power is great for hitting common Pokemon such as Incineroar and Nihilego, as well as other common Rock types such as Tyranitar and Stakataka. The third slot is your coverage option. Clear Smog isn't really big on damage, but is great for resetting stat boosts. Pokemon like Belly Drum Snorlax and Calm Mind Tapu Fini hate Clear Smog as it resets their stats as it can help Gastrodon's teammates to deal with troublesome Pokemon. Ice Beam is another option to deal with Pokemon like Mega Salamence and it also gives another option to hit Landorus. The final slot is between either Recover which is great in combination with its Iapapa Berry to make sure Gastrodon can stick around longer, or Protect to get a guarantee to survive turns and take problematic Z-Moves better. Psychic Seed was popularized by Gavin Michaels (@komvgc) and Chuppa Cross (@ChuppaVGC) who used the item to good success in the VGC 2018 season. Chuppa took a Psychic Seed Gastrodon to finish Top 8 at the 2018 Roanoke Regionals, in which he said that Gavin was instrumental in the creation of this idea. Thanks to the +1 Sp. Defense stat boost, the sample Gastrodon set above can survive Energy Ball and Giga Drain from Ludicolo. Groundium Z is great for teams that might need a Z-Move. This is generally going to be based on Earth Power and is great for OHKO'ing Pokemon that will survive Earth Power, such as Incineroar and Stakataka who can be trained to survive Earth Power, but won't survive Tectonic Rage. Incineroar can help Gastrodon in a very important way. Since Gastrodon absolutely hates Grass types, Incineroar's Fire typing can deal with common Grass types Gastrodon struggles with like Ferrothorn, Tapu Bulu and Kartana. Kartana is the only Grass type that really sees any usage that has a stronger chance to beat Incineroar thanks to Sacred Sword and can even OHKO thanks to its increased chance to land critical hits. Ferrothorn only really runs Grass and Steel type moves which Incineroar resists and Tapu Bulu can run Superpower, Incineroar can be easily trained to survive it. Incineroar also gives Gastrodon Intimidate support which is great. In return, Gastrodon can deal with the Pokemon like Landorus, Nihilego, and Tyranitar that Incineroar struggles with to deal with, which makes these 2 a strong core. Salamence can use its Flying typing and Aerilate ability to hit other Grass types that Incineroar can hit such as Ludicolo that Incineroar can't deal with. In return Gastrodon can handle some Fairy types such as Mawile as its weak to Gastrodon's Ground type moves. Gastrodon can also shield Salamence from Scald burns thanks to its Storm Drain ability. Grass types are the only way to hit Gastrodon for super-effective damage. Tapu Bulu can set Grassy terrain to power up its Grass type moves which already can OHKO Gastrodon without the terrain. Kartana is a very fast Pokemon that can deal with Gastrodon and is common on more teams. Ludicolo only really appears on Rain teams and is the only reason Gastrodon isn't the safest Pokemon to use against Rain teams unless properly played. Being able to use Giga Drain to OHKO Gastrodon and even heal a lot from it thanks to Gastrodon's naturally high HP stat. Celesteela can use its bulk to wall out Gastrodon and easily click Leech Seed to heal up from it. even if Celesteela is burned by Scald, it can heal the damage from Gastrodon and eventually win the 1v1. Bulky Water types like Jellicent can easily wall out Gastrodon thanks to their natural bulk to make sure they can stall out Gastrodon to allow their partners to easily defeat it. Since Gastrodon isn't the most offensive Pokemon, being able to stall it out can help defeat it. Pokemon like Cresselia can easily take its attacks and defeat it, thanks to Cresselia's access to pinch berries. Gastrodon is a Pokemon that can potentially become a massive threats at the 2018 World Championships if supported correctly. Its ability to beat common Pokemon such as Landorus, Mega Metagross and Incineroar and the ability to disrupt set-up thanks to Clear Smog can make Gastrodon. 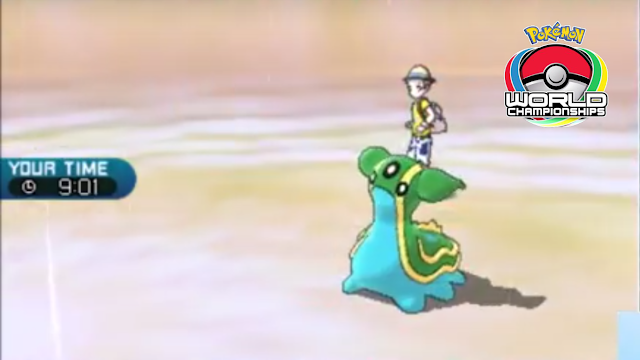 If trainers at the World Championships can make sure Gastrodon isn't basically useless on the field and understand when Gastrodon is taking spots on the field and play it correctly, this sea slug can become a big threat.